Also known as the Nature Isle, Dominica isn’t the typical resort-infused destination like other Caribbean islands. Dominica (not to be confused with the Dominican Republic) has not been over-commercialized or overrun with tourists. Only 29 miles long and 17 miles wide, Dominica’s dense rain forest environment is one of rugged mountains, cliffs and drop-offs that spill into gorges of vegetation or the sea. The island's landscape, shaped by a volcanic past which remains active, supports one of only two boiling lakes in the world. Most of Dominica's beaches consist of fine, volcanic black sand. The island supports 365 rivers, a multitude of waterfalls and several hot water mineral springs. The climate is spring-like; the sun is either shining or it is raining. Rainbows are plentiful ...and experiences are bountiful. 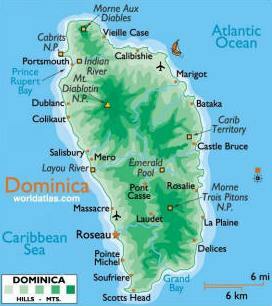 Dominica, (not to be confused with the Dominican Republic), is the middle island in the Caribbean chain.